Maidenhead in Berkshire is just one of the areas in which Shutterly Fabulous measure and install high quality hardwood plantation shutters. Our shutters are made only using the best available kiln dried wood, manufacturing in either Yellow Poplar or Elm. The owners of this waterfront property in Maidenhead, near Windsor have chosen our Elm wood shutters finished in a white paint. The Elm wood has quite a deep grain and retains this grooved effect after finished with our durable UV protective white paint. 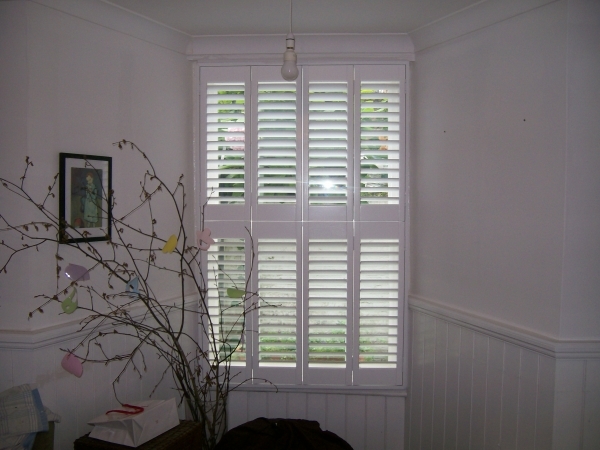 Plantation Shutters made from Elm are very similar in appearance to Oak Shutters. The detail of Elms’ grain is very similar to oak with a deep grain. Wooden plantation shutters made with this Elm wood are offered for customers who prefer to see a more detailed grain within their shutters. Customers choosing elm wood shutters will usually opt for a stained finish, which really shows a stunning depth of grain when your shutters are installed. While Elm is the wood used to make your shutters you can choose a wide variety of different colour stains for your shutters. Or as out Maidenhead customers did, choose a paint finish. To view window shutters insitu, visit the Furniture Village store, Reading.